^ Bruce Weber (17 November 2009). "Edward Woodward, Star of Spy Series, Dies at 79". New York Times. Retrieved 2018-11-30. ^ a b c d "The Equalizer - NBC.com". www.nbc.com. Retrieved 2018-11-30. ^ Dennis McLellan (17 November 2009). 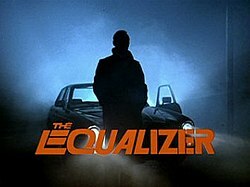 "OBITUARIES : EDWARD WOODWARD, 1930 - 2009 : British actor starred in TV's 'Equalizer'". The Los Angeles Times. Retrieved 2018-11-30. ^ a b c Caroline Rees (20 June 2013). "The Equalizer: box set review". The Guardian US Edition. Retrieved 2018-11-30. ^ a b Adam Bernstein Washington Post Staff Writer (17 November 2009). "Edward Woodward, 79, dies; British actor, spy in 'Equalizer'". The Washington Post. Retrieved 2018-11-30. ^ getTV Staff. "10 Surprising Facts About THE EQUALIZER". getTV. Retrieved 2018-11-30. ^ Galbraith, Stuart (23 May 2017). "The Equalizer: The Complete Collection (plus CI5: The New Professionals - The Complete Series & A Congregation of Ghosts)". DVDTalk.